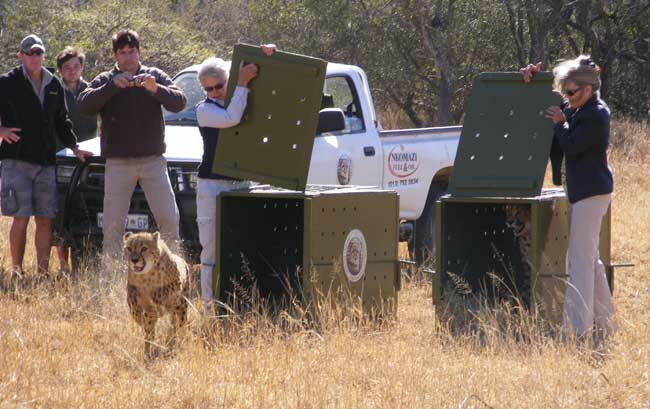 In April the Mountain Zebra National Park in Cradock decided to relocate eight of its cheetahs to new homes. This was in order to ensure the genetic integrity of its cheetah population, as well as the Parkâ€™s ecosystem. Five of these cheetahs took up residence at HESC, and they were followed a short while later by another three of their mates. We recently released two of the males into a holding boma at the Blue Canyon Game Conservancy. Dr Joos Scheepers, owner of Riversdal, said that although they’d had the odd sighting of cheetahs over the years, there were none resident on the conservancy. Tim Parker of Game Ranch Management Services was responsible for the impressive 15000 hectare boma at the Conservancy. We also fitted collars onto the cheetahs before releasing them, so that we can keep tabs on their movements. And there are plans afoot for a female cheetah at the Centre to join the males in the near future. â€œWe have an excellent relationship with the Hoedspruit Endangered Species Centre, and love working with Lente Roode who we find to be incredibly professional. We really appreciate her passing the cheetahs on to us,â€ commented Tim Parker. Click here to view photos of the release.